The last few days have been uneventful. I kept my calendar blank this week in anticipation of Mei-mei's arrival, only to be bored out of my mind. I try to set up play dates and activities for the kids but it doesn't always work out on short notice. So then they're bored out of their minds too and pass the time by fighting. My mother-in-law arrives today, so hopefully Mei-mei will show up soon also. Today's appointment showed Mei-mei doing well with another 10 out of 10. My cervix is still long and unfavorable for induction, but is now dilated to a whopping two centimeters. Also the Non-Stress Test showed that my uterus is "irritable", which surprised me because I'm not feeling anything at all - not even mild contractions. 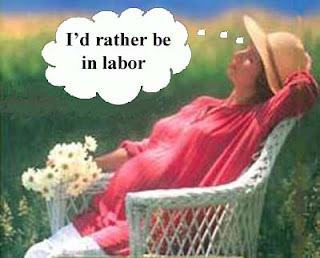 Once my uterus gets as irritable as I am, then we might see some action! Hopefully it won't be too much longer for ya. I didn't know uteruses could be irritable. The more you know. Oh I bet you're getting irritable by now! Hang in there!!! I'm irritable as well so your uterus and my mood should hang out and have coffee! Getting anxious for an update that says Mei-Mei is here! Oh, man! I'm so with you. Last week when I went in for the NST, I was weird to see the little contractions pop up on the monitor. Hopefully, we'll both get good news this week! Best of luck. :) I'll be thinking of you. I'm sure you're anxious for the big day. You're in the home stretch. Oh man...the waiting must be so hard! Hopefully that irritable uterus will get moving and things can start progressing (rapidly) and you can meet your little one very very soon! Thinking about you. Can't wait to meet Mei Mei! Waiting is so hard. I am counting days as well only to have one day feel as long as three. Good on Mei Mei for another perfect score. hopefully not long to go for either of us. I really want to hear that first newborn cry and soon!